Get ready to score a deal on a 1080p projector that can output images at a glorious 150-inch scale. The price? Just $52.94 instead of the usual $100. Mini, portable projectors are all the rage right now, whether it’s for an impromptu big-screen game of Mario Kart, or for something altogether more mundane like crunching numbers in a presentation. 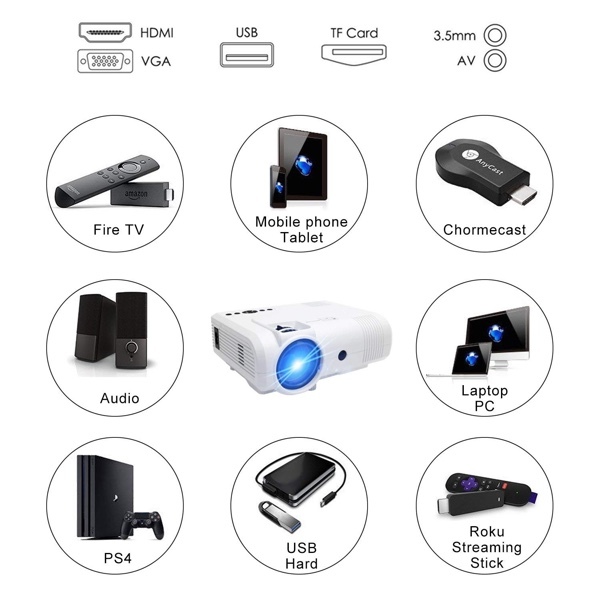 Being able to take something from the small screen and make it easy for everyone to see and enjoy is something that these portable projectors make possible, and with the PoFun projector we’re about to share with you, you can get a 1080p image as large as 150-inches without breaking a sweat. You shouldn’t struggle for content, either, thanks to compatibility with the Amazon Fire TV Stick as well as connectivity including HDMI, VGA, and more. Content from the likes of Netflix and even your very own Google Sheets document is just a few taps are. Basically, you’re not short of options here. It’s all about how you go about it, that’s all. Normally available for $100, the PoFun projector has recently been upgraded for 2019 and right now can be yours for almost half off. Believe it or not, this $100 projector can be yours for just $52.94 if you enter the special discount code when checking out via Amazon. If you think that having a portable projector handy could be something that you would make use off, now is a great time to pick one up. You don’t even need to have a specific use for it today – at this price it could be well worth keeping one of this around just in case. Are you just blind? This is yet again not an 1080p projector. It supports the video input signal but output is 800×600. Come on Redmondpie. You are better than selling that crap.